With the Advertising Standards Bureau (ASB) fielding 56 complaints about Wicked Campers’ offensive van slogans, including 11 so far this year, the company is showing disregard for the system, failing to respond to any rulings, whether for or against it, since mid-2010. ASB operations manager Brian Gordon told Marketing that Wicked Campers was responsible for a slight drop in compliance rates to the industry-regulated determinations. That slight drop means compliance rates currently sit at 99.45%. 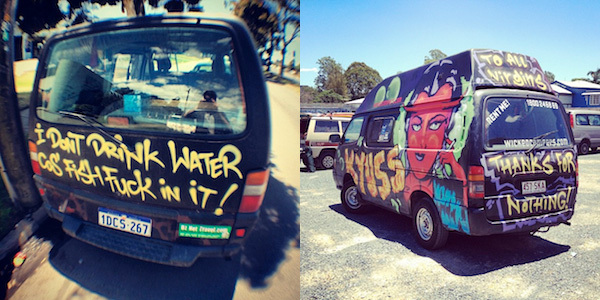 Prior to 2010, when Wicked Campers started ignoring the ASB, compliance was sitting at 99.9%. Little can be done in the case of an advertiser that ignores rulings and uses its own media, but the ASB and its administrator, the Australian Association of National Advertisers (AANA), reject the notion that this exposes flaws in the self-regulatory system or the AANA Code of Ethics. 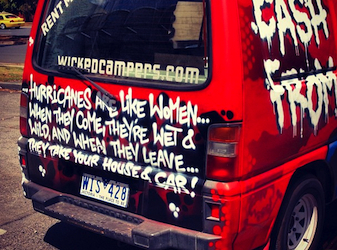 “It is inconceivable that Wicked Campers choose to not only write the misogynistic ‘joke’ but also then publicise it through their moving, billboard vans,” Orbea wrote. “If you love God burn a church”. “Fat girls are harder to kidnap”. According to an update on Orbea’s petition page, Wicked Campers has since apologised and, “committed to removing all misogynistic slogans from their vans within six months”. The Australian Greens also passed a motion in parliament condemning the company’s behaviour. 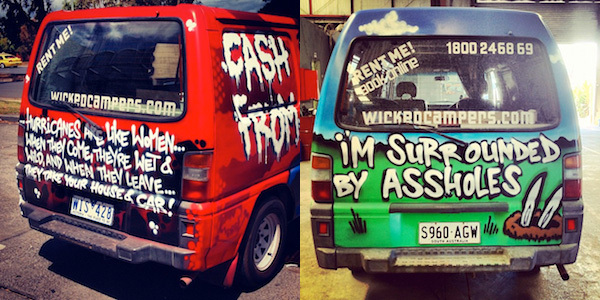 Wicked Campers stopped formally responding to complaints that were upheld by the ASB in 2010, but has previously maintained that the artwork on its vans is “not advertising”. “Our campers are adorned with individual graffiti artwork concerning a wide range of themes, some of which contain a political or philosophical message. We do not deem this artwork to be ‘advertising’ or ‘marketing communication’ even in the loosest interpretation of the terms,” Wicked Campers said in one response from 2008. “The business owner has agreed to paint over the vans. As you will understand, a few of these vans are out on hire around Australia. Our painter is in Brisbane, so next time these vans pass through town we will ensure they are painted over,” one response states. The ASB’s Brian Gordon denies that the Wicked Campers case highlights a loophole in the regulatory system or a weakness in the Australian Association of National Advertisers (AANA) Code of Ethics. “The actions of one recalcitrant business does not define the national system of advertising self-regulation.The situation with Wicked Campers is quite unique. As a business, it has chosen to disregard what a community representative body has found to be against the standards of taste and decency,” Gordon says. Gordon says that compliance to ASB determinations was strong, at 99.45%. He admits that Wicked Campers’ non-compliance explains the drop from 99.9% prior to 2010. AANA director of regulatory affairs Alina Bain says the fact that Wicked Campers’ lack of compliance was so unique highlighted the robustness of the self-regulatory system. “Over the past 15 years there has never been a case of a major advertiser not complying with an ASB determination so it would be wrong to presume that Wicked Campers’ behaviour will be repeated, particularly when you consider that all the major media owners support the self-regulatory system and would refuse to run an advertisement in the highly unlikely event that a brand owner chose to flout an ASB determination,” Bain says. Marketing contacted Wicked Campers but business owner John Webb had not responded at time of publication. We also attempted to gain a government perspective on this issue but the Australian Communications and Media Authority (ACMA), the Attorney General’s department and the Department of Communications determined the AANA to be the most appropriate body to comment.